Just in time for Memorial Day!! SLICE 1 cup of the strawberries; set aside. Halve remaining strawberries; set aside. LINE bottom of 13×9-inch baking dish with cake slices. Top with sliced strawberries and 1 cup of the blueberries. Spread whipped topping evenly over berries. 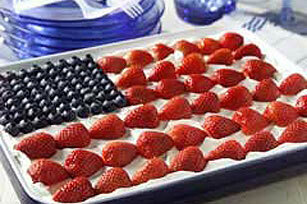 PLACE strawberry halves and remaining 1/3 cup blueberries on whipped topping to create a flag design. Refrigerate until ready to serve.